Queuing stanchions, like crowd control barriers and retractable belt displays, are made from stainless steel to ensure long-lasting use in any location. The black finish matches any décor whilst looking professional to appeal to visitors in any environment. 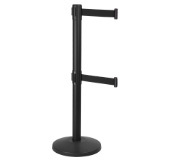 The base is made from cast iron which provides a stable stanchion. 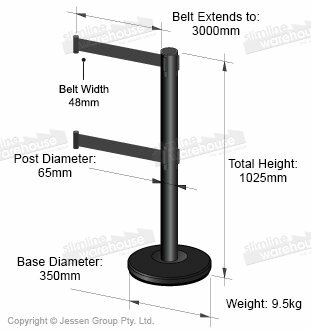 The queuing stanchions feature (2) belts to provide increased security. There is a retractable belt in standard position, and one halfway down the pole to prevent cutting under and accessing areas that visitors shouldn't be entering. 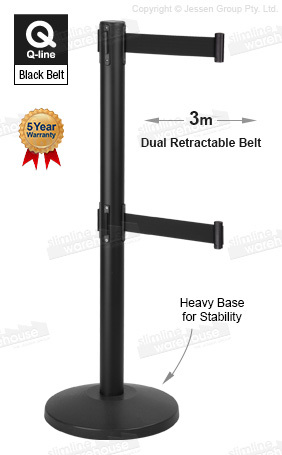 This retractable queue post has 3m heavy duty nylon belts with each cassette, that can be connected to the corresponding 4 way clips. Order today to better set-up a queue or section off an area at your business. Our online catalogue is available by clicking here, where you gain access to hundreds of great displays that are priced to sell without compromising on the quality of units to provide products that will last for years to come. For over 20 years, Slimline Warehouse has been providing goods to Australians. Most orders placed by 1pm will despatch same day to anywhere in Australia, including Perth, Hobart, Melbourne, Adelaide, Brisbane, Canberra, & Cairns!